Having multiple USB power outlets in a vehicle is no-doubt a nice thing to have. There are many available in all shapes and sizes along with most newer units having Quick Charge 3.0 built-in. With that in mind below is our picks for the best USB car chargers with multiple ports with links to reviews. As always be sure to read the reviews here, Amazon, or elsewhere to be sure a unit is a good fit for you. This small compact USB 3.0 car charger has 2 USB ports. while small and compact it get the job done and a good unit at a low-cost. Each port charges at 2.4 Amp for a total of 4.8 Amps. If you need more than 2 port unit there are many more multi port devices. 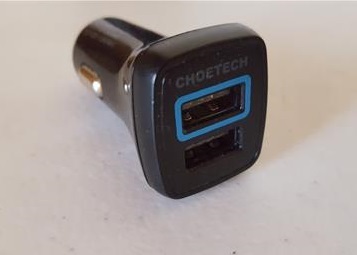 If you only need an extra USB slot the CHOETECH QC 3.0 is a small low cost charger. It is a short unit that plugs straight into a cigarette lighter and gives 2 USB charging ports. One port has QC 3.0 while the other is a standard charging slot. The CHOETECH is a good Fast Charger with an extra port for other devices. Aikenuo makes this multi port car charger with a total of 6 charging plugs. It has 4 ports for quick charge 3.0 and 2 for ISmart. The design is like many home units with a long extender cable. 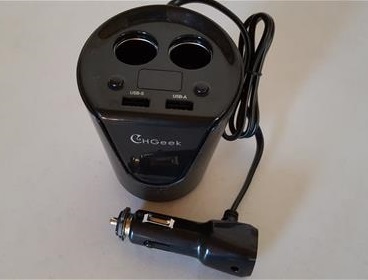 This CHGeek USB car charger takes a different approach with 2 USB ports and 2 cigarette lighter slots. It is built to sit in a cup holder location and also has a LED that displays the Amps being used. The 2 USB ports are not Quick Charging ports but the Cigarette Lighter ports are when used with a QC 3.0 charger like those above. 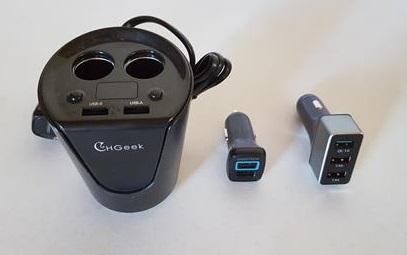 The CHGeek is good for expanding power in a car while being able to monitor the Amps being used. This cigarette lighter extender with multiple ports and sits in a cup holder. It has 2 stander smart ports and 1 USB 3,0 port. It also has 2 cigarette lighter plugs to add in more devices if necessary. Adding multiple USB power ports in a car or truck is easy to do with a low-cost unit. There is many good units with those above simply some we have used and like. When using any cigarette lighter be sure to check the vehicles manual for port Amp capacity as to not overload it. Overloading a lighter port can cause the fuse to blow or possibly more.